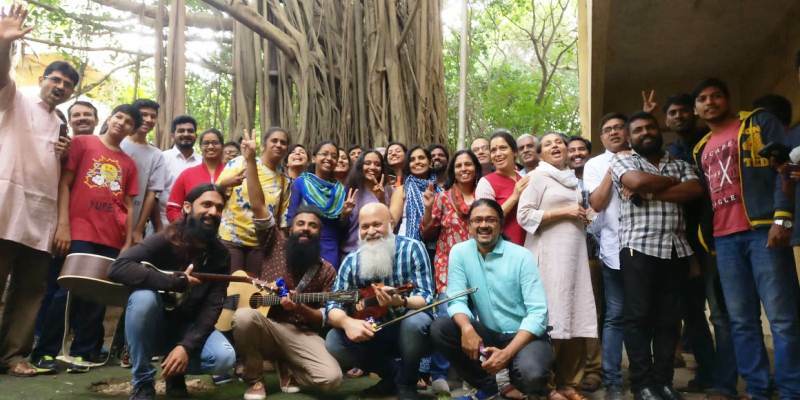 “One Sunday morning, Swarathma set out to use their music to draw attention to the trees which were proposed to be chopped down to make way for a mall,” writes Rashmi Pai-Prabhu. The Venue – Indiranagar BDA complex, Old Madras Road. The Cause – Saving over 170 absolutely striking and beautiful trees deemed to make way for yet another mall. The Campaigners – Indie folk band Swarathma, The Residents of Indiranagar, Cine artists Shruthi Hariharan and Chetan. The Audience – Over 200 passionate residents of Indiranagar and surrounds. The Time – 8:30 am, Sunday, Aug 19th 2018. It was a usual Sunday morning in Bangalore, quiet and lazy, which belied the sight of over 200 people gathered together under the shady trees in the almost dilapidated environs of the Indiranagar BDA complex. Being a weekend, it was quite early in the day. It was inscrutable from afar as to what the congregation of people were up to. If one ventured close however, one would notice that they were gathered around the widely popular – Indie folk music band ‘Swarathma’, very renowned for making original music to address social causes. Swarathma were set out today to use their musical expertise to draw attention to the fact that over 170 trees were proposed to be chopped down to make way for a mall. Their plan was to gather the people of Indianagar under the shade of 4 prominent trees and make the audience cognizant of the value of green cover. The band had identified four tall spectacular trees to sing under namely a Peepal tree, a set of six rain trees, a Pride of India tree and a majestic Banyan tree. Carefully chosen songs that were relevant in meaning to nature and its upkeep were duly performed to mesmerise the audience and bring the point home. Swarathma as a band have always been known as facilitators of social change. It was indeed heartening to see how they promoted this very relevant cause and came by on an early Sunday morning to try and get the message across through the all-pervading medium of music. While bass guitarist Jishnu Dasgupta enthralled the audience with his easy wit, Vasu Dixit, the lead vocalist took the audience on an alternate musical journey with his powerful renditions. Accompanying instrumentalists Sanjeev Nayak and Varun Murali weaved in their magic seamlessly resulting in some unifying and soul stirring moments. The event also doubled up as a tree walk with experts guiding the audience on trivia about the chosen trees. To add to the magic, Cine actor Chetan descended upon the already engaged audience and recounted the story of ‘the giving tree’ further adding to the importance of the cause. Also present at the venue was another popular cine actress Shruthi Hariharan who added value by just being there. There were tiny tots too, and they were seen having a jolly good time swinging from the branches of the old banyan tree. It was indeed overwhelming to see that such a large group of people had come out so early on a Sunday morning, to support music and also to support a noble cause. Having been a true blue Bangalorean for the past 42 years, I have always revered the green cover that our beautiful city has provided. Trees which have taken years to grow and develop into a canopy and green cover for the city are now being torn down in a matter of seconds to make way for gargantuan concrete structures. Is this really the requirement today? Can we as residents not take a moment to imagine the repercussion this uncontrolled development is going to have on our future generation? And can we not stand up in unison and raise our voices against such an action? For this green or what is left of it is exactly what we will bequeath to our children tomorrow. Rashmi Pai-Prabhu is a Bengaluru-based writer and translator.